1. 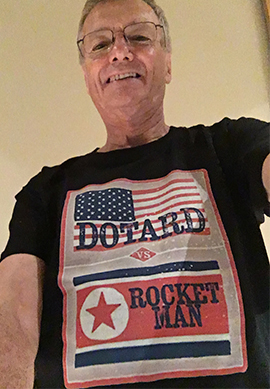 Nuclear conflict versus twitter conflict – the word of 2017 for me is dotard, the word is a winner on so many level. It also won for Kim Jong-Un, he was a clear victor over Donald Trump in their twitter battle. Why bother with nuclear war when you can win on a much more important level to Mr Trump, a twitter war? Rocket Man worked fine for Elton John, why not for Kim Jong-Un? 2. Stupidity of 2017 – assorted terrorists who can’t even kill themselves in a suicide attack (Akayed Ullah, New York City), or they manage to kill five Argentines and a Belgian when they’re after Americans (he only got two) (Sayfullo Saipov, New York City again), or 50% of the people you put in hospital are foreigners rather than Australians (Saeed Noori, probably not even a terrorist, Melbourne). In every case they’ve also made life more difficult for their fellow nationals (people from Bangladesh, Uzbekistan and Afghanistan in those three cases). In Melbourne, where I live, some refugees from South Sudan are currently giving their homeland a bad name with a spate of Sudanese crime. And a final case of dumb stupidity for 2017 – Tyler Raj Barriss calls in a US swat team, announcing some family attack, murder, shooting, the cops turn up, guns drawn, at a miscellaneous address and as a result some poor innocent guy gets shot, dead. Barriss is a serial offender in the false alarm business, he looks like an idiot and hasn’t the fool realised that he’s living in the USA where confrontations with armed police often go wrong? 4. Crazy definitions – why call your child Jihad unless you want to cause trouble for him at airport security queues in later life? An eight-year old with that name was killed in Sydney when a careless driver crashed into a school building. Only a month earlier a French court opposed the name being given to a French child, although remarkably in the Sydney case an Australian parliamentarian named Jihad spoke at the funeral! In fact jihad means ‘struggle’ or ‘effort’ as well as its holy war connotations. I remember back in the mid-90s hearing of a student uprising in Afghanistan determined to overthrow the often appalling mujaheddin forces who had trashed the country in the post-Soviet era. ‘Great,’ I thought, but in Pashto ‘student’ is talib, hence the Taliban. 5. Saudi madness – well I’ve blogged recently on Saudi hypocrisy, the Yemen war which is probably going to be seen as Saudi Arabia’s Vietnam, the absurd Saudi dispute with Qatar, and the totally ridiculous attempt to get the Lebanese Prime Minister Saad Hariri to resign, a move which spectacularly backfired. This month’s Prospect magazine has an excellent article by Iona Craig which comprehensively explains the many conflicting parties to the Yemen conflict. Of course after reading it I knew a lot more about the Yemen morass and understood a lot less, just like my understanding of the Rohingya story after my recent visit to Myanmar. 6. Key 2017 facts – the Australian economy is as big as Russia’s? Well not quite, but they’re very close despite the huge difference in population. And the Bangladesh per capita GDP is now as big as Pakistan’s, that surprised me too. 7. Teenagers & Perennials – At the same London dinner where the Russia-Australia GDP figures popped up somebody commented that the word ‘teenager’ was not invented until the 1940s and until there was a word to define that age group nobody had thought of marketing to them. So until we had ‘teenagers’ we didn’t have teenage movies, teenage fashions, teenage foods, teenage problems. What we need today, the diner concluded, was a word for those ‘old’ people who once upon a time were on a brief downhill slide from retirement to death and now were travelling, walking, scuba-diving, eating, going to rock concerts, you name it. If we had a catchy term to define them we could really start selling them stuff. I’m not sure perennial, despite this Washington Post story, is the answer. 8. George Brandis to London – does every high-ranking Australian political failure have to be awarded the plum job of Australian High Commissioner to the UK? Still the current incumbent – Alexander Downer, Lord Downer to some people – has just been revealed as the original source of the Trump-Russia connection story. My recent visit to Kiribati was a reminder that I went to a talk once where Mr Downer proclaimed the island nation was the second worst place he had ever visited, just behind the worst: Nauru. 9. The ‘I can’t believe this is happening’ moment – I cannot believe I was glued to the news reports as I followed the Alabama election. I mean who cares about Alabama elections outside the American deep south? Despite which I sent this text to Maureen: ‘looks like Jones will beat Moore.’ Quickly followed by a text reply from Maureen: ‘yeah, just heard, fantastic.’ I mean WTF, when Australians start following some backwoods election in Alabama? The really disappointing key fact from that election, however, was that while blacks (thankfully) had overwhelmingly voted for Doug Jones (98% of black women in fact), the big supporters for Moore were white males (72%). Oh dear. 10. Credit card surcharges – I’ve been unhappy about this growing practice all year, airlines were pioneers in the field, but more and more Australian restaurants are adding on a percentage if you decide to pay by credit cards. Often it’s hidden until the last moment and two nights ago a restaurant decided to add on a charge even when I used a debit (ie direct payment) card. ‘OK, I’ll pay cash,’ is my response. And in the US I hate those absurd ‘resort fees,’ I’d prefer US$40 more on the room rate than US$35 of resort charges, it would just feel more honest.